The Master Suite is luxurious and provides uninterrupted views over the bay. The bedroom is stylish and very spacious with panoramic windows, elegant furniture and African arts. There is a king-size bed with high quality mattress, two lounge chairs with a coffee table, an executive desk and a Full HD 50" Plasma screen with Blu Ray DVD player and satellite TV. The magnificent state of the art bathroom has a freestanding luxurious bath tub which is easily the main feature of the suite. There are two basins, a toilet and a bidet, all designed by ALESSI, and a GROHE rain-dance shower completes the double shower for a unique shower experience. A Nespresso Cappuccino machine and sixteen different coffees come as a delight for you taste-buds. Owners Suite (85 square metre) has a spacious open-plan and unique corner location with panoramic windows overlooking the ocean and the sandy dunes of the Walker Bay Nature Reserve. The living area has comfortable lounge chairs with a designer table, a state-of-the-art 4 by 2 meter white leather couch, a King-size bed, a Full-HD Beamer with Blu Ray DVD player and satellite TV, a home cinema with a 2.5 meter electric screen and a romantic fireplace. The open and freestanding Jacuzzi bathtub and the modern king-size bed complete the offering making this an ideal romantic get-away. A Nespresso Cappuccino machine and sixteen different coffees come as a delight for you taste-buds. 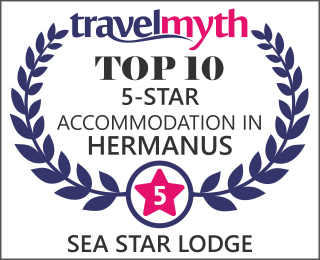 The comfortably appointed Bay View Room offers views of the Atlantic Ocean and the Hermanus skyline. It is elegantly furnished with lounge chair and coffee table, a king-size bed as well as a business desk. There is a Full HD 40" LCD screen with Blu Ray DVD player and satellite TV. The bathroom features a modern freestanding deep soaking tub in which you can relax and a separate shower, both with amazing sea views. The panoramic sliding door provides direct access to the balcony and the mirrored solar-shield windows ensures total privacy. On your balcony you find a small table and two chairs. The Honeymoon Suite has a spacious open-plan and unique corner location with panoramic windows overlooking the ocean and the sandy dunes of the Fynbos Nature Reserve. The living area has two comfortable lounge chairs with coffee table, a King-size bed, a Full HD 50" plasma screen with Blu Ray DVD player and satellite TV, a fireplace and an executive desk. The open and freestanding designer bath completes the offering making this an ideal romantic get-away. There is also a separate open rain shower and a Nespresso Cappuccino machine. The Expedition Room allows you to enjoy the amazing sea view from the bath, the separate shower as well as the ultra-cosy Queen-size bed. The Expedition Room is equipped with an executive desk, a 32’’ LCD screen with Blu Ray DVD player and satellite TV. Air-conditioning and heated towel rails complete this very comfortable offering making your stay an unforgettable one!